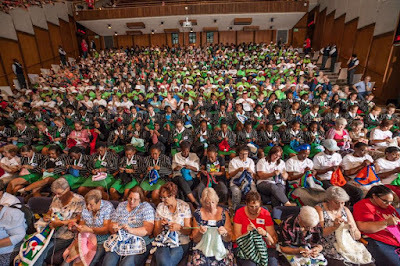 Sunday, January 27, 2019, saw over 700 Knitwits from 67 Blankets for Nelson Mandela Day crochet simultaneously for 27 minutes at the Linder Auditorium at the Johannesburg University of the Witwatersrand. This was their 5th World record attempt and was in celebration of the organisation’s 5th birthday and Mozart’s birthday, this was undertaken in collaboration with the Johannesburg International Mozart Festival. Some 737 "KnitWits for Madiba" crocheted constantly for 27 minutes to attain their latest world record - for the most people crocheting simultaneously. The previous record of 604 people was held by the Singleton Crafters in Australia. This auspicious day marked not only the birthday of Mozart (born in 1756), but also the fifth birthday of the 67 Blankets initiative, which has won several awards and smashed world records in its desire to continue Madiba’s legacy by keeping thousands of people around the world warm. The documentation has been sent through to the Guinness World Records head office in London, and Carolyn Steyn, founder of the 67 Blankets, said they hoped to have it ratified within the next few weeks.